Hard drives don’t have an infinite lifespan, and they could die on you anytime. To our luck, hard drives also store all of our precious data, and we can’t replace some of that data. If a hard drive stops working or an error corrupts your data, you may lose all your data without any prior warning. Thankfully, there are some ways to monitor and check hard drive health and get notified before the inevitable happens. You can use a Hard Drive health monitoring tool to see the condition of your hard disk and take decisions before it stops working and takes your data with it. If you get a warning before the hard drive meets its end, you will be able to create a backup of all your important data and save it. For this purpose, there are many free hard disk monitoring tools available that will give you the complete status of your hard drive, such as temperature, disk errors, S.M.A.R.T. information and read/writes, etc. In this post, we will list down seven popular hard drive health monitoring programs that help you check heard drive health. These tools will give you enough information to keep a tab on your hard disk’s health. Let’s start with something that is simple, CrystalDiskInfo is a primary disk checking tool that offers almost all the information an average user may need. And it represents the information in a simple manner. As soon as you launch the program, CrystalDiskInfo will show you how your hard disk is doing with a simple “Good” or “Bad”. You will also be able to see the current temperature of your hard drive in real-time. It will also give details on the hard drive build and make, such as Firmware, Interface, Transfer Mode, Standard, and even Features. Furthermore, you can also get real-time details on hard drive attributes, including Read Error Rate, Spin-Up Time, Sectors, Power-On Hours, Power Cycle and more. These values are shown with the current value and worst value so you will know how wrong your hard drive health has gone in the past. Acronis Drive Monitor is a feature rich hard drive health monitoring tool that offers reliable information directly. It offers everything you will need to check the status of your hard drive health, but its notification system is excellent and perfect for unexpected failures. 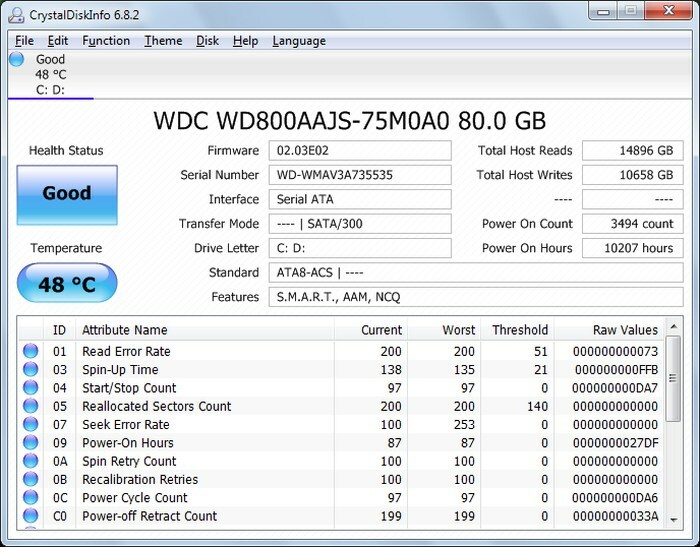 In the quick overview, Acronis Drive Monitor shows total power on time, current hard drive health (based on many factors), and the temperature of the hard disk. You can also access S.M.A.R.T. parameters to see the S.M.A.R.T. information extracted from the hard drive, including Reallocated sectors, Error rate, Spin Retry Count, Temperature, Uncorrectable sectors and Total LBAs. It adds an “OK” sign next to each attribute for you to understand if there is any problem or not. It also extracts information for Windows native event log to give warnings right inside its interface. Best of all, Acronis Drive Monitor will show notifications in the system tray if there is any issue with the hard drive. Additionally, you can also set up email alerts to get an email as soon as a problem is detected. PassMark Diskcheckup is a very robust hard drive monitoring software and shows work best in the hands of an expert. Diskcheckup offers some quick information regarding hard disks in the disk info section, like capacity, health status, interface, read/write, latency, sectors, and a plethora of commonly supported features to see whether your hard drive supports them or not. This information works fine for a novice user, but it gives a detailed overview of S.M.A.R.T. information along with the history that is more usable by an expert user. Furthermore, it can also run “Self-Tests” on supported hard drives to check hard drive health using stringent tests. It also gives you full information regarding hard drive LBAs (Logical Block Addressing), including LBAs at the user level, native level, and total disk LBA. On top of all these features, it also lets you quickly check the health of multiple hard drives installed with a simple click. As the name suggests, HDDScan is for running multiple types of scan on your hard drive to determine its health. It doesn’t offer many details regarding the hard drive making and type, but its tests are worth giving it a try. You can run long mode test to see if your hard drive has any error or may require instant data recovery. Its S.M.A.R.T. scans are also really powerful, and you can get complete S.M.A.R.T. information along with analyzing log pages and testing temperature. It also has support for scanning USBs, Raid, FireWire and even SSD. Even if you have an SSD, you can use HDDScan to extract identity reports and even S.M.A.R.T. information. You can also change its theme to your liking and it also has command line support if you are interested. However, it should be kept in mind that each scan takes 5-10 minutes so you will have to wait a bit. Another simple tool on this list that does its job right with minimum confusions. 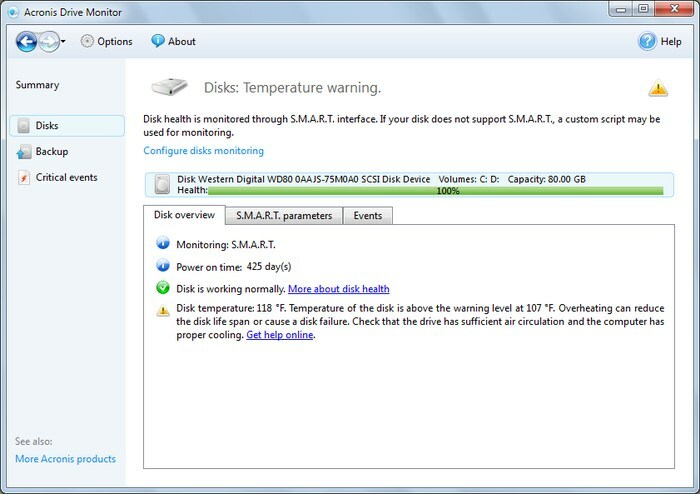 HDD Health uses simple gauges to tell you the current temperature and hard drive health. It shows health in the percentage that makes it very easy to see how much damaged your hard drive health is. Of course, if you are using the hard disk for quite some time then the results will not be 100%, but as long as you are above the 70% threshold, it should not be a big problem. It also provides necessary information such as Manufacturer, Firmware, Capacity and serial number, but for some reason, it wasn’t able to extract this information from my hard drive (may be older hard drive). You can also see the S.M.A.R.T. information in its simple interface. From the options, you can setup notifications and email alerts to keep you updated with hard drive health status. Overall, HDD Health is perfect if you want a tool to give simple hard drive health situation and keep you updated. 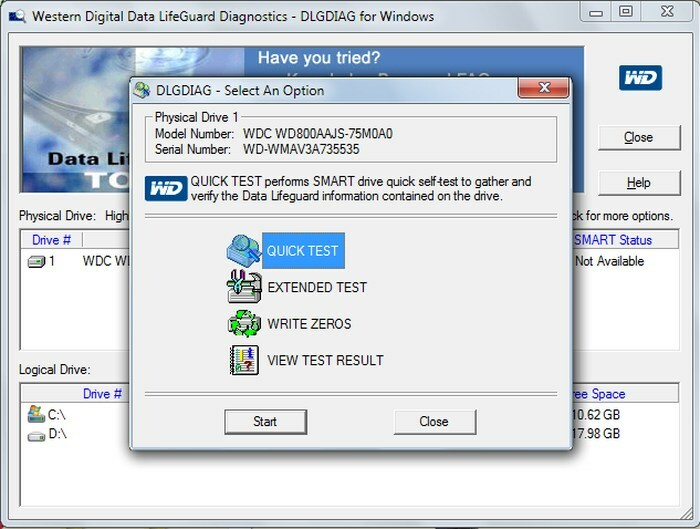 The popular data recovery and hard drive solutions company Western Digital also offers a handy hard drive health monitoring tool. It is a scanner that scans your hard drive for errors and problems and reports back. There are two types of tests, short and extended. The short test is quicker than extended, but it is very basic and focuses only on bad sectors and standard errors. You will have to use the extended test to check the actual hard drive health including spins and read/write errors. You can also extract S.M.A.R.T. information and individually test sectors of each drive created on the hard drive. During the tests, the drives will become inaccessible and will close already opened disk locations, so make sure you save all the data before running any tests. Windows also comes with a hard drive health monitoring tool that can give you some basic information regarding your hard drive health. It isn’t as feature rich as the above tools, but if the information it provides is more than enough for your needs, then why go for any third-party solutions? 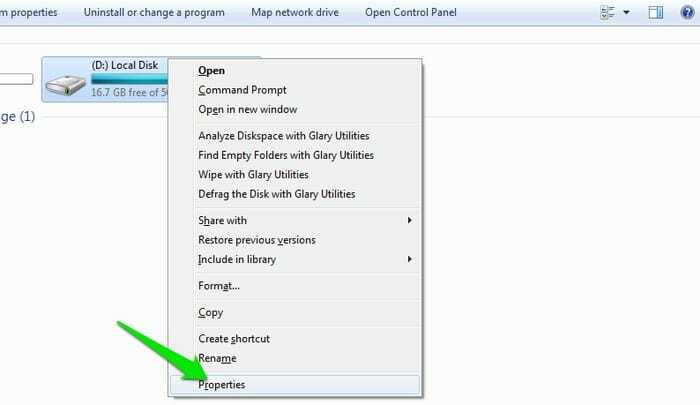 Go to My Computer and right-click on the drive that you would like to check for errors and bad sectors. Now select “Properties” from the context menu. Now, move to the “Tools” tab. Here, click on the “Check Now” button and start the checking process. It will scan and fix basic errors and will let you know if it is unable to fix any error and give you a report to diagnose. Making sure your hard drive is working properly is crucial. Your hard drive might be just worth a few bucks, but the data it may hold could be priceless. So use these tools and make sure you are always ready for any types of hazards. We also recommend that you always use a backup system to ensure your critical data is safe and don’t just depend on hard drive health. A hard disk may get corrupted due to shock or liquid, so don’t solely rely on it for your precious data. Do let us know in the comments how you monitor and check your hard drive health. Previous: How to Insert a PDF into a Word Document?